Chocolate and orange complement each other so well (think Terry’s Chocolate Orange, although don’t try to copy the TV advert and knock the cake on the table to break it into segments!). This recipe arises from an experiment and is the second version I have made. The first reason for the experiment was to see if I could replicate a good Chocolate Orange flavour successfully in a cake. 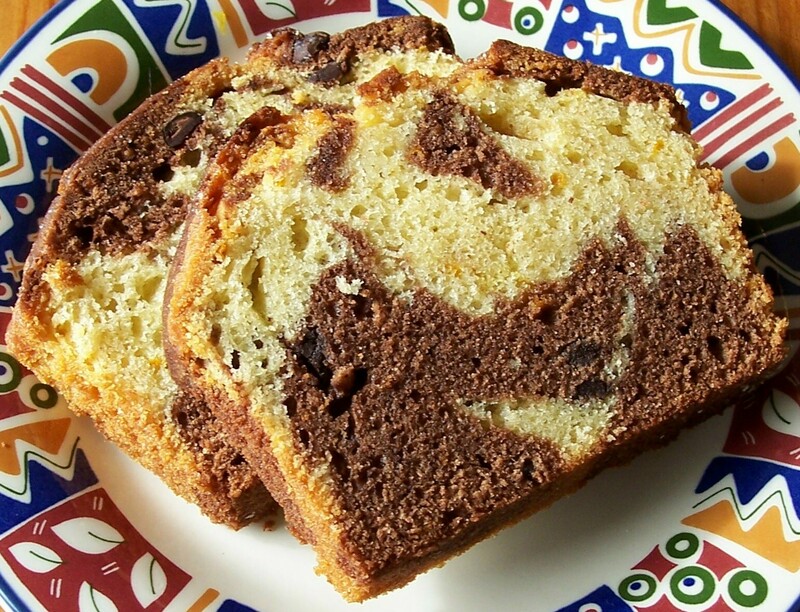 I decided that with two flavours this was the ideal candidate for a marble cake, where the batter is divided into two (or more) portions each coloured and/or flavoured separately and then randomly placed in the tin. The result is a very attractive patchy cake where every slice is unique. The chocolate part was easy: cocoa powder supplemented with some good quality chopped chocolate. I used Green & Black’s Fairtrade cocoa (I had been itching to open a newly bought tub anyway) and wonderfully rich Dark Cooks Chocolate (72% cocoa – silver & brown wrapper), available from the baking sections of most larger supermarkets. Getting a good orange flavour, however, proved less easy. My first version of the cake just did not have enough juicy orange flavour. Even though I used orange zest and orange juice (in place of milk) throughout the cake and not just in the orange half, adding some mixed peel as well, the flavour was overpowered by the chocolate. This started me thinking: I could not use any more orange juice as it would make the cake too wet. How about using marmalade, I reasoned? ….. Then I had an epiphany! I made the Fragrant Marmalade Cake and realised that what this cake actually needed was a good hit of Orange Flower water. Scent and taste are so closely linked that this lifts the orange flavour to a whole new level: the first warm slice, eaten with my eyes shut was heavenly! Next time I might just add the marmalade and/or try chopped orange flavoured chocolate as well: I will update the recipe, if necessary, to include any more improvements. 1. Mix the cake as above adding the zest to the undivided mixture before the flour and the milk. 2. Once the flour has been added, divide the mixture into two bowls. To one bowlful add 2tbsp sieved cocoa powder, the chocolate chips and about 1tbsp milk. 3. To the second bowlful add the mixed peel or marmalade (if using) and mix in 1tbsp orange flower water. 6. Bake in the centre of the oven: 170oC/325oF/Gas 3 for 50-60 minutes, or until well risen. A skewer inserted into the centre of the baked cake should come out clean. 7. Turn out onto a rack. 8. Optional: Before the cake cools, for a pronounced orange flavour, blend together 1tbsp hot water and 1tbsp sugar until dissolved and add 1tsp orange flower water. Use the skewer to make a number of deep holes in the surface of the hot cake and gently pour over the mixture allowing it to soak in. It will leave a fragrant sticky sugary crust. 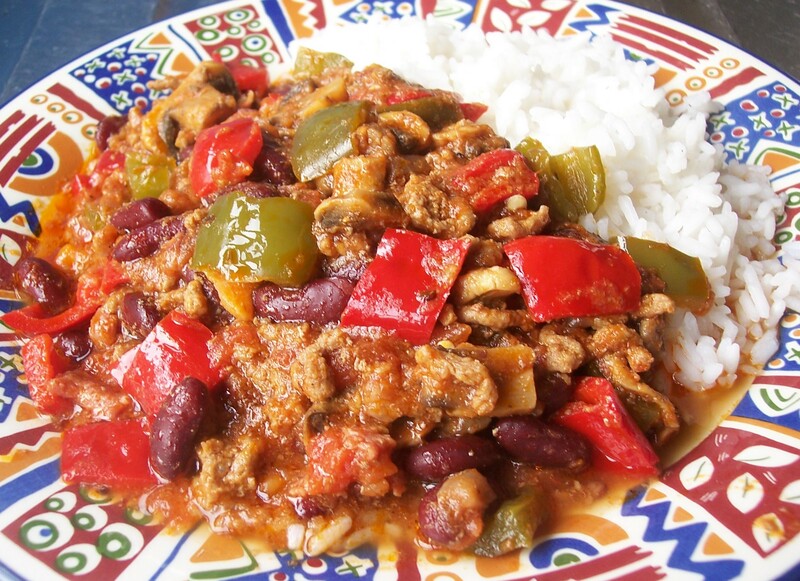 Chilli con Carne is one of our most popular family recipes. The name comes from the Spanish chile con carne, meaning ‘peppers with meat’, but it is actually the official dish of the State of Texas in the USA, making it ‘Tex-Mex’ rather than Mexican, as is sometimes thought. My version is not taken from any particular book but has been adapted and improved whenever I have discovered a new ‘twist’. Some years ago we had an excellent Chilli con Carne for lunch in a pub, leading me to experiment with adding cumin as well as chilli powder, which adds extra depth to the spice flavours. More recently I discovered that Nigella Lawson, in her book Feast, adds cocoa powder to her Chilli con Carne. What a good idea! Chilli can be added to chocolate recipes, after all, so why not chocolate to chilli recipes? It really does enrich the sauce and you do not detect the flavour at all. Smoked bacon similarly adds good background flavour, with diced red and green peppers (capsicums) adding colour, as well as vegetable content. If you wish to make the dish a little healthier by reducing the red meat content per head, add finely diced aubergine which will cook down to be almost invisible. The amount of chilli powder to be added is optional, of course. When my children were young I used to cook the mixture without chill, divide it between two pans and then add the spices later (not ideal, I know). One pan had the full (adult) quantity of spices and the second had some cumin and a very little chilli, just enough for the children to get used to the taste: one was known as Chilli con Carne and the other as Carne non Chilli! My ruse obviously worked as we all now eat food cooked in the same pan! As with the Lasagne al Forno I posted a few weeks ago, this method is my own tried and trusted recipe and special because it has been adapted and improved . It is worth making a double quantity as the recipe can be frozen for later use, as can individual portions of leftovers. Chilli con carne is lovely finished with a spoonful of cool and soothing soured cream. 1. If using aubergine it is usual to sprinkle it with salt, place it in a colander, cover it with a plate and place a weight on top of it for at least 30 minutes, to let the juices can run out. You can cut out this step if you are short of time: I have never noticed much difference in taste. 2. Mix the cumin and chilli with the water to make a paste. Heat the oil in a large saucepan, stir in the spice paste and fry briefly (no more than 30 seconds). Reduce the heat, stir in the onion and garlic and fry gently for 5 minutes, or until soft. Add the diced bacon, mushrooms and mixed herbs (at this point the diced aubergine should be added, if using), put a lid on the pan and cook for a further 5 minutes. 3. Add the beef mince, stir to break up and cook for 1o minutes, stirring occasionally so the meat cooks through. Stir in the cocoa powder, tomato puree, tinned tomatoes and water, stir and bring to the boil. Season and taste. Reduce heat, cover and cook for a further 10minutes. 4. Add the chopped peppers and red beans, stir well, cover and cook for another 5-10 minutes, depending on how well cooked you like your pepper. Check seasoning. 5. Serve on a bed of white rice or as a filling for a jacket potato, flour tortilla or pancake along with a spoonful of sour cream. A small side salad makes a good accompaniment along with a few tortilla chips if serving with rice. I had almost given up my hunt until a chance conversation with a cookery loving friend – thank you Jo – who lent me a delightful little book, a charity shop purchase. In the book: Making Gingerbread Houses and other Gingerbread Treats by Joanna Farrow, was the Lebkuchen recipe I had been seeking, plus instructions for decorating the finished biscuits. Truly this is a book for those who like to mess around in the kitchen, also giving recipes for golden and chocolate gingerbread and how to form them into the most amazing Gingerbread creations, including ideas for using crushed boiled sweets as stained glass windows. (As the gingerbread bakes the sweets melt and form a brittle coloured shell.) Wish I had visited the charity shop first! 1. Cream the butter and sugar together until they are pale in colour and fluffy. 2. Beat in the egg and treacle. 3. Sift the flour, ground ginger, ground cloves and chilli powder into the bowl. Using a wooden spoon gradually mix the ingredients together to make a stiff paste. 4. Turn this paste onto a lightly floured surface and lightly knead until it is smooth. 7. Divide the dough into equal portions, one for each cutter you are using. I used three different shapes of about 4.5cm/1¼inch: heart, square and round, each of which was differently decorated. Roll out the dough on a floured surface to a thickness of ¼in/8mm. Cut out the shapes and place on the baking sheet with a space between each to allow for a very small amount of expansion. The dough can be re-rolled and cut, using a little additional flour to stop it sticking, until it is all used up. 8. Chill trays of uncooked Lebkuchen for 30 minutes. 9. Bake for 8-10 minutes. Cool on a wire rack. Once cool the biscuits can be stored in a well sealed container until you are ready to decorate and/or eat them. a) Make an Icing Glaze: mix together 1tbsp lightly beaten egg white and 1tbsp lemon juice with enough sifted icing sugar until you have a mixture which is like thin cream and thinly coats the back of a spoon. Use this to cover the biscuits, tapping the wire tray as in a) to evenly distribute the glaze. This lemony glaze is a lovely complement for the ginger flavour as well as being very traditional. b) Melt dark chocolate in a dish over a pan of boiling water (or very carefully in the microwave) and coat the biscuits. Do this on a metal rack over a tray. Tapping the tray slightly will help the chocolate run evenly over the biscuit. Add a decoration of chocolate sprinkles while still wet. d) As a) using dark chocolate and a dusting of sifted icing sugar while still slightly wet. e) As a) using white chocolate and a dusting of cocoa powder while still slightly wet. f) A thin layer of marzipan under a coating of chocolate. Other decoration if you wish. As mentioned above, there is another type of Lebkuchen made with ground almonds and decorated with candied peel. 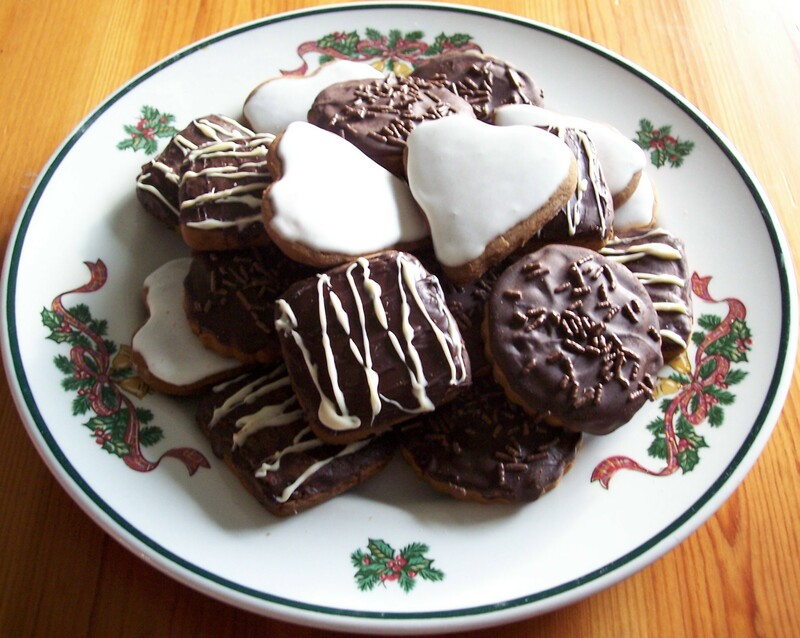 I plan to try this recipe for White Lebkuchen from the Good Food Channel website another year. Lebkuchen can also be cut twice as thick (making half as many finished biscuits, of course) giving a softer more chewy biscuit/cake. These thick Lebkuchen are covered with a coating of dark chocolate as in a) above and then decorated with glace cherries, almonds and walnuts. These are both something to try another time and I will make a separate post if they are successful. In her novel Chocolat, Joanne Harris writes a little about the Mexican background of the history of chocolate and the novel’s heroine, Vianne, serves her customers hot drinking chocolate flavoured with chilli. It may seem unusual, but cocoa has also long been used to complement the flavour of meat and is a key ingredient in the Mexican dish ‘Mole Poblano’. Chocolate and chilli are surprisingly good together, the heat of the peppers blending beautifully with the rich dark flavour of cocoa. The Basque country of South West France, the city of Bayonne in particular, is well known for its fine chocolate and on holiday last year we enjoyed sampling a chilli flavoured variety. The chilli was surprisingly subtle but with a definite hot spicy ‘kick’. I was delighted to discover this recipe for a spicy marinade for roast lamb which contained chocolate – and it was every bit as delicious as I hoped it would be. I made a few adaptations, using fresh orange in place of orange juice and squeezing some of this juice over the rice to give it a citrus flavour. The recipe would work equally well with some good thick lamb steaks or slow cooked lamb fillet. The original recipe for Leg of Lamb with Chilli Sauce comes from Hot & Spicy Cooking: Exciting Ideas for Delicious Meals with recipes by Judith Ferguson, Lalita Ahmed and Carolyn Garner. 1. Trim the paper thin skin and any large pieces of surface fat from the lamb with a sharp knife. Place lamb in a shallow dish. 2. Cut one orange in half and remove a slice or two. Place in a covered container to reserve as a garnish. Squeeze the juice from the remaining pieces of orange and take enough from other oranges to make up to a generous ¼pint. 3. Leaving aside the cornflour, mix at least half of this orange juice with the remaining marinade ingredients. Pour this over the lamb, turning well so it is completely coated. Cover and refrigerate for 12-24 hours, turning occasionally. 5. Remove lamb to a serving dish to rest and keep warm. Add any remaining juices or a little water to the pan, stir to loosen the sediment, strain and put aside for a short while. Skim off any fat that rises to the surface. 6. Mix the cornflour with a small amount of water in a sauce pan and then stir in the skimmed, strained marinade juices. Heat gently, stirring all the time, until thickened. (This can also be done in a jug in the microwave by alternately giving short bursts of heat and stirring until thickened.) More orange juice, wine or water can be added if necessary. Keep a little orange juice back to stir through the rice, if you would like. 7. Garnish with the reserved orange slices and sprigs of coriander. Serve with white boiled rice, stirring through just a little reserved orange juice to give a zesty flavour, the sauce and mildly spiced vegetables curry (so it does not overpower the lamb dish, but including more coriander which complements the citrus flavours). The original recipe suggests you could also serve this with boiled potato and conventionally cooked vegetables. One of our favourite French desserts is Tarte au Citron or French Lemon Tart and it is surprisingly easy to make. It is one of those food items that we cannot leave France without having at least once. Tarts of varying quality can be found across France in supermarkets and patisseries and often have the word ‘Citron’ drizzled on top in chocolate or gold wording on chunk of decorative chocolate. This recipe is for a much simpler version without the chocolate but you could add that if you wished as well. I just served a summer fruit accompaniment of blueberries and strawberries with my Tarte au Citron and gave it a dusting of icing sugar. For those who wished, pouring cream was available at the table. It makes an excellent dessert when entertaining friends. This recipe came from The French Kitchen by Joanne Harris & Fran Warde: Joanne Harris is a well known novelist many of whose books I have enjoyed (including Chocolat which was also filmed). I would certainly repeat this Tarte au Citron recipe and next time would very much like to make it with authentic Pâte Brisée pastry as suggested in the recipe. This soft but often difficult to handle pastry, made with butter, egg and sugar, is regularly used for French patisserie. On this occasion I substituted the simpler shortcrust for the recommended pâte brisée (see basic recipe post for information on how to make these). 1. Heat the oven to 200oC/400oF/Gas 6 for blind baking if you are using a shortcrust pastry shell. 2. Make pastry case (either Shortcrust or Pâte Brisée) using basic recipe and chill for at least 30minutes. For the shortcrust pastry shell only, blind bake for 10minutes (I fill the empty pastry shell with dried beans). 3. Place the eggs, sugar and cream in a bowl with the lemon zest and juice and whisk until creamy. 4. Melt the butter gently and whisk into the lemon mixture. 5. Pour lemon mixture into the chilled pastry case. 6. Carefully place tart into the centre of the oven and bake for 15 minutes. 7. Reduce the oven temperature to 160oC/Gas 3 and bake for a further about 20minutes or until the filling has set. 8. Leave to cool for at least 1 hour before serving. 9. Decorate with a dusting of icing sugar or chocolate shavings. Can be served with summer berries or slices of orange and if needed, some pouring cream. A simple and delicious dessert of cherries with cream and custard which can, apart from adding the cream and decoration, be made ahead of time. Chocolate cake is best for the sponge layer – if I use chocolate swiss roll I lessen the sugar in the custard slightly, otherwise the trifle can be very sweet. To soak the base I use a generous sherry glass of Carina brand Cremandorla: Crema aux Amandes, a Sicilian almond flavoured aperitif made with Marsala wine, which we buy when on holiday in France and can be found in many French supermarkets: Leclerc, Super-U, Carrefour, Intermarche… (I suppose it really should be Kirsch but I have never tried it – I find the combination of almond and cherries works well together.) I have never managed to find cherry flavoured jelly, but would use it if I did, although a full sugar type could make the dessert over sweet. (Another alternative would be to set the cherry syrup with gelatine.) Even though they are supposed to be pitted it is worth double checking the cherries as I always find one or two stones – laborious but necessary and much better than damaged teeth! Grated chocolate can be frozen for later use. As an alternative to Cherry, a Chocolate Orange Trifle can be made using sliced fresh Orange or tinned drained Mandarin Oranges in place of the cherries and orange jelly, with sherry or orange liqueur to soak the base. These recipes are my own invention. 1. Line the base of a transparent glass dish with slices of cake, swiss roll or trifle sponge fingers and soak with the almond liqueur or sherry. 2. Drain the jar of cherries, reserving the syrup and reserving 8 good shape cherries for decoration. Place the remaining cherries in the dish in an even layer on top of the sponge. 3. Follow the instructions on the packets of jelly powder using the syrup from the cherries, topping up with water as necessary. I find it best to initially heat about 150ml/¼ pint syrup, then stir in the powder until well dissolved and finally add the remaining syrup and water. Adding ice cubes rather than water helps to set the jelly quickly. 4. Pour most of the jelly liquid gently into the bowl, leave to set, add the remaining jelly liquid and leave this to set as well. 5. While the jelly is setting, make up a pint of custard, varying the amount of sugar used according to the sweetness of the base layer. Leave to cool. 6. When cool and the jelly set the custard layer can be added on top of the jelly. If it is too hot, or the jelly not fully set, you may get a striped or marbled effect: not so pretty but it will taste fine. 7. To serve: Whip the cream and add evenly on top of the custard. Grate the chocolate using a cheese grater (for larger curls use a potato peeler) and add in a broad band on the cream around the edge of the bowl. Place the 8 reserved cherries evenly round the edge on top of this layer. 1. Grease a deep ovenproof pudding dish – 1.2litre/2pint capacity. 2. Sieve flour and cocoa into a bowl with the other pudding ingredients. 3. Mix together well, either for 2 minutes with a wooden spoon or ½ minute with an electric mixer. 4. Tip mix into the greased pudding dish and level the top. 5. Mix together cocoa, nuts and 2ozs of the demerara sugar and sprinkle over the pudding. 6. Sweeten hot coffee with remaining 2ozs demerara sugar and pour over the pudding. 7. Bake in a moderate oven Gas 4/350oF/180oC for 50minutes to 1hour. During cooking the sponge rises up and over and the coffee mixture forms a thick fudge sauce underneath. 8. Sprinkle over a few more toasted nuts to serve, if you wish. Serve with cream or ice cream.